2 year 100% Customer Satisfaction Guarantee! 100% refund of purchase price. 123Inkjets launched in 1999 and established its headquarters in southern California. They sell toner and ink for thousands of printer models from all of the popular brands like Hewlett Packard, Lexmark, Canon, Dell, and Brother. 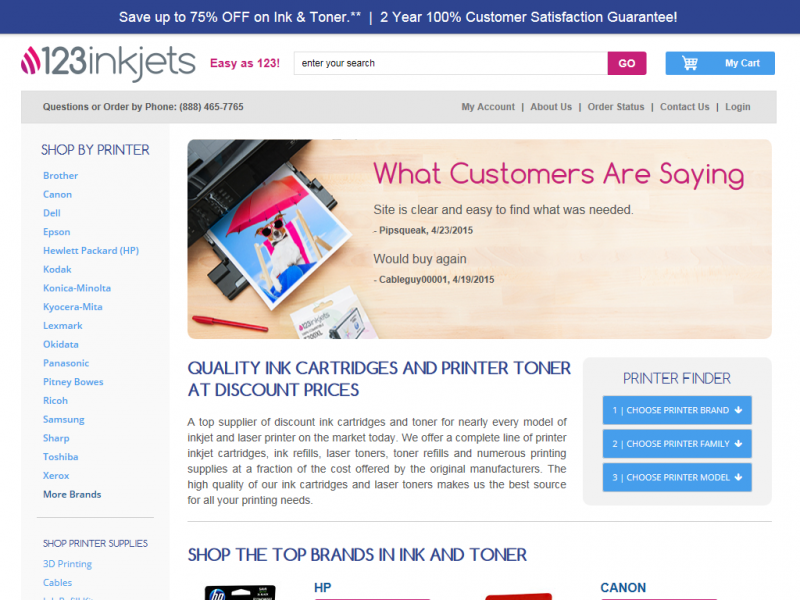 Whether you are looking for brand name (OEM) cartridges made by the company who made your printer or remanufactured, and compatible cartridges, 123Inkjets have some of the lowest prices online. 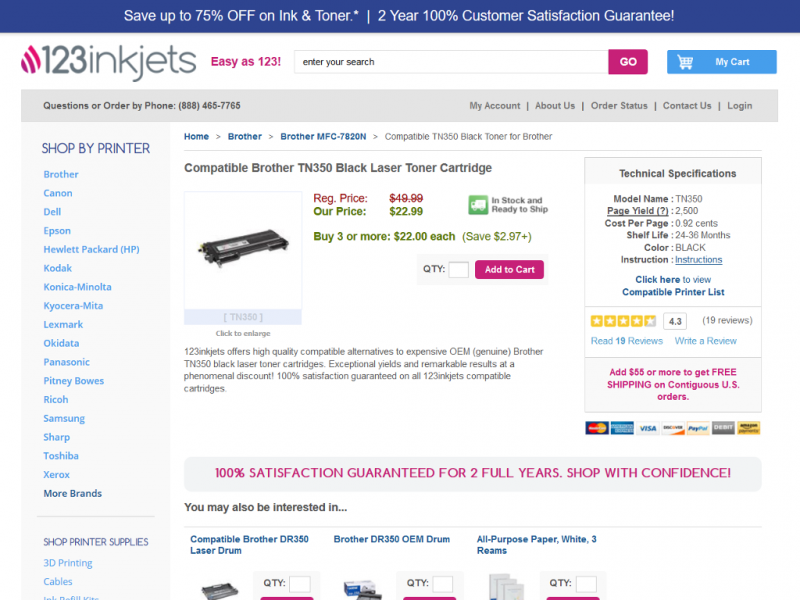 123Inkjets.com's compatible cartridges are brand-new and while they are made specifically for your printer, they will differ slightly in appearance because they are made with 123Inkjets patented design. A 123Inkjets remanufactured cartridge is an OEM cartridge that has been cleaned, repaired if necessary, and rigorously tested to ensure that it performs at the same level that a brand-new product would. Both will work well with your printer while saving you usually at least half the price compared to a brand new OEM cartridge. Finding your printer model's page on 123Inkjets is easy as 123! Just use the printer finder located on the home page which is a 3 step process. Your first select your printer brand. You then select your printer family (which is filtered based on your previous selection), and finally you select your printer model. You are then redirected to your printers homepage. From here you will find a description of your printer along with a list of all compatible cartridges (Remanufactured, Compatible and OEM). Each item in the list includes an image, description, price, and any bulk pricing options (ie if you buy more than 3 you save more). Clicking on the title of the item in the list will then bring you to the cartridges homepage. This page includes a description and other information like shelf life, cost per page, page yield, and any instructions. You can also read any reviews from others who have purchased this product. Reviews are based on 5 stars and include a title, description and the bottom line (which asks the question if you would recommend this product or not). A 2 year 100% quality and satisfaction guarantee is available for remanufactured and compatible cartridges products purchased at 123Inkjets. Receipts are not required for returns but ink cartridges must be at least 70% full. Under this guarantee products can either be returned or exchanged. Shipping charges are not refundable. Original equipment manufacturer (OEM) cartridges (which are brand names like Canon and HP) are not covered by this guarantee unless the merchandise is unopened. You have to contact the manufacturer directly about their warranties for open products. 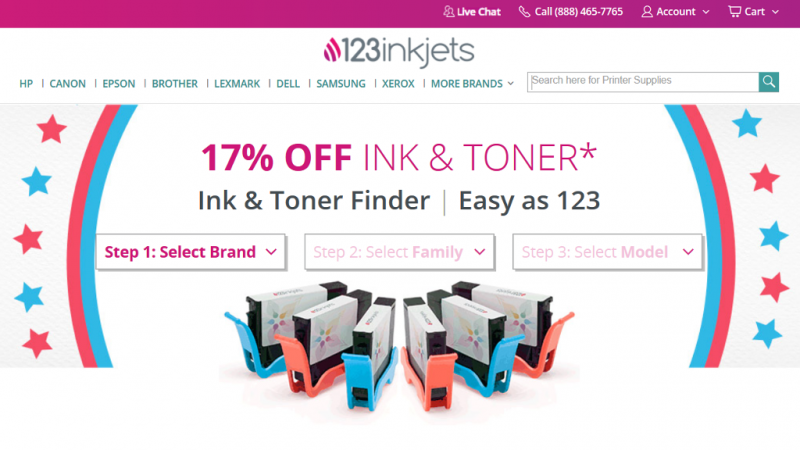 You can expect to receive up to 75% off your ink and toner compared to name brands when you purchase a 123Inkjets remanufactured or compatible cartridges. 123Inkjets accepts all popular credit and debit cards along with personal checks and money orders. 123Inkjets.com offers free shipping on all orders over $55. This shipping option is applicable for all orders in the contiguous US shipped via USPS Mail with Delivery Confirmation or UPS Ground. Estimated delivery time for free shipping is 3-5 business days. Free Shipping is not valid outside the contiguous US. Orders under $55 are charge a flat rate fee of $4.95. You may upgrade your shipping option for your order to UPS 2nd Day during checkout. You will be required to pay the actual 2nd Day shipping rates. For shipping to Canada or US Non-contiguous different shipping rates apply depending on location and weight. Order and shipping tracking is available for your order when you log into 123Inkjets. Once your order is placed an Order Confirmation email is sent which includes a tracking number so you can check the progress of your shipment. 123Inkjets customer service is available by phone, email and live online chat from Monday to Friday 6am-6pm PST and Saturday and Sunday 7am-4pm Pacific Standard Time. This is 4Inkjets sister site and it is just as good. 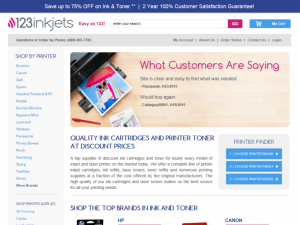 They sell great products at great prices especially if you choose a compatible toner or ink cartridge. I wish they had free shipping for any order size (instead of a minimum of $55 before free shipping) but that is just a small complaint. The best prices are to be had when you do a bulk order which can save you even more money. This usually kicks in when you order at least 3 of the same item. This doesn't include brand names as far as I can tell. The reviews of the ink product is also very nice as it helps you to figure out if a remanufactured cartridge or a compatible cartridge is the best way to go. Usually it doesn't make a difference but I noticed for a few of the Dell printers it does. Don’t make the same mistake I made. Not only did the cartridges not work, they ruined my printheads so now I’m going to end up spending much more than simply buying the right cartridges in the first place. When I contacted customer service for a return, they insisted on an exchange and refused to process the return... forcing me to reverse the charge through my credit card company. I do not regularly write reviews but this is a dishonest company that sells bad product. 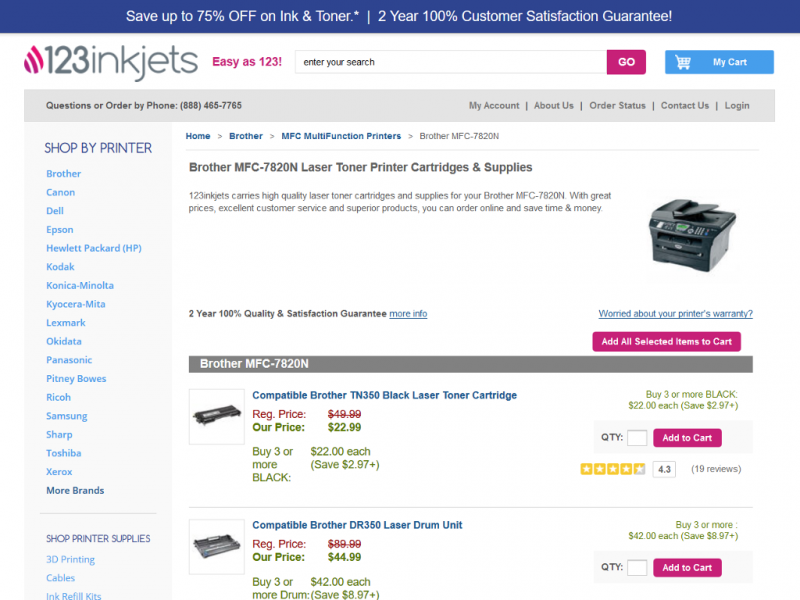 Ordered a number of cartridges for my HP Printer because of favorable pricing. The first cartridge i opened leaked all over, ruined my clothing and nearly ruined my printer. It ended up costing me more than i saved. They have a money back guarantee but do not pay for return shipping. Replaced Ink Cartridge at no cost! I have ordered from 123Inkjets many times over the last 5 years or so and have always received the cartridges I ordered and everything worked fine. My last order was a little different as one of the cartridges didn't work. I originally had picked 123Inkjets as they had a good return guarantee and BBB rating was an A so it looks like I will be testing the return policy. I called customer service and told them that I had tried using one of the cartridges and it did not work while the other ones did. The lady on the phone was really friendly and told me she would send a replacement out right away at not cost to me. That was great news and I received it under a week. I am glad I picked 123InkJet as my ink supplier as with the guarantee along with their low prices makes it well worth it. There is no way that I am going to Staples for the prices they charge for the ink for my 5 year old printer. It almost is the price of a new printer. I have been using 123inkjets for years and have not really had a problem with them. I do find that I can't seem to print as many pages from the no name brand cartridges as from an actual Cannon printer cartridge but it is close enough and with the price being like a third of the cost of an actual Cannon cartridge I am willing to over look a few hundred pages. The no name brand cartridges fits fine in my Cannon printer and the Brother my kids use. We have never had a problem of them not working. I haven't had ink issues before when I bought ink for my hp printer from 123inkjet. I have probably bought ink for the same printer about 5 times before in about the same amount of years. I usually always buy the re-manufactured/refurbished cartridges but this time I went with the no name brand as the others were out of stock. It worked fine for the first month but then I didn't use my printer for 2 months and the next time I tried printing something the page was blank because the black ink had gone dry. Not terribly happy about this because at the time I needed the printer for important job. I recommend just buying the refurbished OEM cartridges and not the no name brand ones.